Property Details: 2 BR, 2 BA Vacation Rental, sleeps up to 8. Phoenix Four condo, beach resort home in Orange Beach.Welcome to the vacation you will remember! 7th floor offers fantastic views from sunrise to sunset. Interior updated to reflect everything a vacation home should feel like: Classy Kitchen fully equipped with major appliances granite counters and tile backsplash. * New Titanium Cookware, eat healthy at this condo. * Master bedroom has king bed with memory foam topper & private door out to the patio. * Master bath features modern new fixtures and lots of counter space with vanity seating. * Bedroom two has 2 queen beds and has an updated private bath! * 3 Flat Screen TV's & Blue ray player, Satellite TV & WIFI * Play station 4 with two controllers bring your games! * Bluetooth speaker will pair with your device, play your tunes! * Need a little more sleeping space there is a new queen size sofa sleeper from Lazboy with upgraded memory foam mattress in the living area. This is a gated community Phoenix 1, 2, 3 & 4 has many additional amenities such as:* Tennis Courts * Basket Ball Courts * Outdoor Grilling Area * Outdoor & Indoor Pools * Phoenix 1outdoor pool is heated with solar energy * Many Hot Tubs * 4 Kiddie Pools * Game Room * Racquet Ball Courts * His and Hers Saunas * Workout room with Ocean view * On site Ice machines, Vending and ATM. 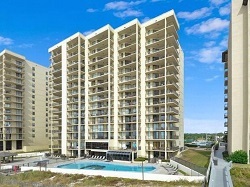 Phoenix Four Condo Rental in Orange Beach AL.